Tie Fighter is a game for the ATARI 400 or 800 computer requiring Atari BASIC 16K for cassette or 24K for disk system. The object of the game is to destroy the Tie-Fighters before they destroy you and your Rebel Base. 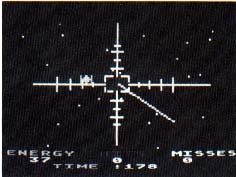 You have a pilot's perspective into space, with cross-hairs in the middle of the screen. An enemy Tie-Fighter appears and approaches. By moving the joystick you can maneuver to bring the enemy into your sights. Push the button to fire at him. If you don't hit the Tie-Fighter directly it may take several shots to bring him down. If he manages to escape your pursuit (go off the screen) he will join other successful fighters attacking your base. If 10 Tie-Fighters get past you, your base is destroyed. This game has four levels of difficulty, but as you get better the game speed will continue to increase even beyond level four. You start out the game with 40 units of energy. Each time you fire, the energy will go down one unit. When the energy runs out or when 10 Tie-Fighters have escaped, the game will be over. For every 10 points (or hits), your energy will be refueled to 40 units again and all misses will be cleared. There is a time limit for you to destroy the Tie Fighters. When the timer runs out, the Tie-Fighter on the screen will be cleared and it counts as if you had let the Tie-Fighter escape. Pushing the space bar while you are playing will freeze the game. Pushing the space bar again will enable you to continue where you left off. Notice the smooth animation of the Tie Fighter. This is due to the fast string-handling ability of Atari BASIC. The PM$ is defined to be the Player/Missile Base. When a player needs to be moved, all the program has to do is to assign the player's data(PO$) to the PM$. A -- check collision flag. E -- the units of energy. H -- horizontal movement flag. HARDERS -- level of difficulty. MI -- misses (Tie-Fighters escaped). PO -- location of player within Player/Missile Base. PO$ -- Player 0 data. SC -- score or hits. T -- units of time. V -- vertical movement flag. X -- horizontal coordinate of Player 0. Y -- vertical coordinate of Player 0.